Fish Vava'u Tonga with Grant Dixon Group Fishing HolidayTour travel&co. Join Grant Dixon from NZ Fishing News on a hosted fishing trip to tackle the crystal clear waters of Vava’u in Tonga. This amazing trip includes entry into the 19th Annual Vava’u International Fishing Tournament where you will fish in teams of 4 to troll for blue, black or striped marlin, sailfish, mahimahi, big yellow fin tuna and wahoo. Don’t miss out! Booking agent is travel&co and the Tonga trip is hosted by NZ Fishing News. Trip price is based on per person (pp), twin share accommodation in NZD and for a selected travel period only. A NZD $1400 deposit is required at the time of booking, with final balance due 90 days prior to departure. Group size is based on 4 anglers per boat. Add-ons are available at an additional cost. Unless specified prices exclude, insurance and other activities and all items of a personal nature. Credit/debit card surcharges, single supplement and cancellation/change fees apply. 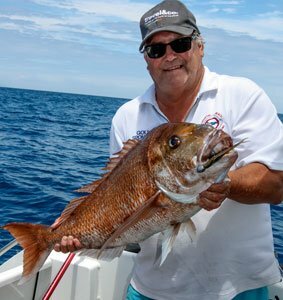 Over the years Grant has fished extensively throughout New Zealand, the Pacific and beyond, both as an angler and a trip host. He and Mark Airey started the NZ Fishing News Vava’u International over 20 years ago, initially in association with the Tongan Tourism Authority. It was first fished out of Tongatapu’s Royal Sunset Resort and when the numbers outgrew the availability of charter boats it was moved north to Vava’u. Grant likes nothing more than seeing people enjoy their first tropical species successes, especially if it is a billfish.